What exactly is e-learning and who can take part? The dictionary definition of e-learning is ‘learning conducted via an electronic medium, typically on the internet.’ However, here at Learning Heroes we believe that e-learning is much more than that. It’s a way to engage employees, support their development needs and to promote key change (be that in terms of organisational behaviour or cultural change). For us it’s a way of presenting learning that is visual, bite-size, animated, injected with some humour (when appropriate) and full of character, be that through what you see on screen or the voice-over you hear when participating. A lot of e-learning (sorry guys) can be very boring, but when done right it’s the perfect supplement to a wider L&D strategy for any organisation. What types of courses are available and are some more suitable for e-learning than others? There is an e-learning course for pretty much anything from learning ‘how to knit’ to ‘how to build jet engines’. There has been a misconception that e-learning can replace traditional forms of training and used purely to cut costs. We think the industry is waking up to the fact that you can’t replace on the job training, mentoring, coaching and the social learning which happens in a live environment. As more and more people embrace experiential learning e-learning has to evolve further. Experience is the best teacher and e-learning has to facilitate better experiences. That means focusing on practical advice. E-learning is great for knowledge transfer but it really should be used as part of a wider strategy. As a result, not every course is suitable for e-learning, at least not in entirety. A number of our clients now use e-learning as PrE-Learning (for example sending an overview prior to a class room session) and this can often be the way to combine styles of learning together. Blended learning means that the learner can take an e-learning course, but then have that supplemented with workbooks, cheat sheets, fact sheets, additional reading and extra videos and visuals. This all rounds off the overall experience! Why is e-learning becoming so popular? Organisations love it because it can save costs (though this doesn’t mean it is cheap, it’s more about value for money), it can offer great flexibility and it can speed up the roll out of training programmes but the learners aren’t always as enthusiastic. We’re on a mission to change that. At Learning Heroes we are designing e-learning with the learner in mind and we are encouraging others to do the same. The modern worker expects content to be engaging, match their learning style and be respectful of their time and intelligence which is why we are seeing a big shift towards “Blended Learning”. This means using a mix of online resources, such as e-learning, and offline learning, such as traditional face to face training. Can you tell us anything about the future of e-learning? What will a classroom look like in 2075? That’s the kind of question that always excites us here at Learning Heroes. It is clear that the next generation of learners are going to have different needs than today’s learners. The millennial learner (Generation Y) wants to do things on the go, doesn’t have the same attention span and wants all things digital – this means we have to think differently. Some scary statistics show that Generation Z have an attention span of 8 seconds, use up to 5 devices and 33% of them do their research and education online. Furthermore, in 2015, 46% of students took at least one course online and by 2019 it is predicted that 50% of all university courses will be online. The bottom line is that learning will be different and we think that e-learning will continue to have its place in an increasingly digital learner’s world. Learning Heroes are more than just an e-learning production company. We’re a group of people that are passionate about learning – inviting you to come on a journey with us. We’re a collection of course authors, qualified trainers, instructional designers, animators and customer service superheroes. We create courses using the latest discoveries in accelerated learning to deliver the biggest impact to people’s lives and careers. Our content is now readily available on OpenSesame as we think it’s a match made in heaven, so to get started we thought we’d do a blog about e-learning and why it is important! Learning Heroes now have over 140 courses in their online library, covering collections that range from Personal Development to Health & Safety, as well as Project Management, Finance Skills, Toolbox Talks and a lot more besides. Their subscribers also get access to a whole world of blended learning, which makes the job of an L&D specialist a lot easier and the role of the learner a lot more satisfying. Tom Moore is the Head of HQ (Managing Director) for Learning Heroes. He is responsible for many things, including feeding the white cats, dropping some fish food into the shark tanks and making sure that the winged monkeys are ready to go. 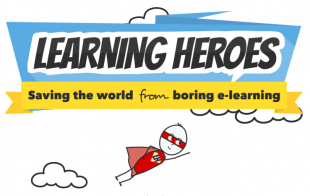 Joking aside, over here at Learning Heroes, we have a great team of superheroes (and no villains), so his job is supporting them on their joint mission to save the world from boring e-learning.